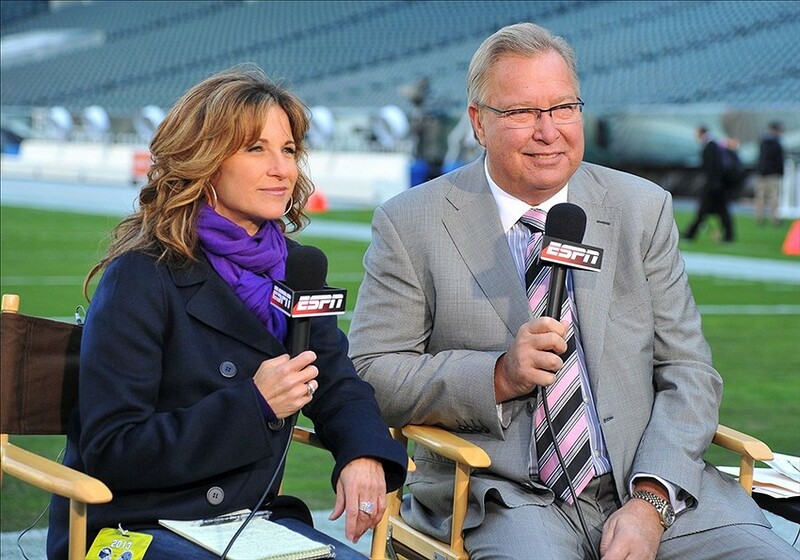 I really like Ron Jaworski (photo above with Philly native Suzy Kolber), the former Eagles quarterback who has become one of ESPN’s go-to analysts when it comes to the arcana of the NFL. He’s smart and he’s funny and self-deprecating — though I do wish he would explain how he could have come up so woefully short in the 1981 Super Bowl loss to the Raiders. One thing about him that irks me — he never criticizes any player. Ever. Check it out and you’ll see I’m right. Except when the person who makes a list contradicts the list within a few days. Jaworski released his annual list of quarterbacks from No. 1 to No. 32. The list was based on Jaworski watching film of the 2013 season and it had Denver Peyton Manning’s on top. That’s no surprise. It also had the Eagles’ Nick Foles, at No. 15, which drew the ire of the fans who once cheered and booed Jaworski (sometimes in the same game). And it had Super Bowl winner Russell Wilson, of Seattle, listed at No. 9. So is being ranked No. 15 better than being ranked No. 9? Maybe Jaws is channeling Sarah Palin, that great political seer whose predictions and dictums are in such disrepute that no one takes her seriously. Watch it, Jaws. Now, you’re going to tell us that you can see Russia from your house.